Paul Batch is a young contemporary painter who is developing a reputation for his evocative atmospheric landscapes. He captures the fleeting and ephemeral light cast by the passing sun or rising moon. He focuses on transition, painting times of day or changing weather conditions and their dramatic effects upon the natural and uninhabited landscape. Batch says, "I am drawn to the beauty of transitional moments in time... twilight, a passing storm, the moon rising. The beauty comes in part from our awareness that these moments are fleeting." Batch studied at the Hartford Art School. 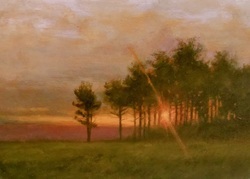 He has received numerous awards including a Gold Medal from the Connecticut Plein Air Painters' Society. He is an Elected Artist Member of the Connecticut Academy of Fine Arts. He has given several guest lectures and workshop demonstrations on painting and presently teaches at the West Hartford Art League. While he draws inspiration from many places, Batch lives with his beautiful wife in Connecticut.